Steel’s versatility, in terms of its composition and properties, its strength-to-weight ratio and its ability to be infinitely multicycled into new products sets steel apart from other materials and has been instrumental in its ongoing success. This article briefly explains how iron and steel made. Separate articles discuss how the material is converted into steel construction products and the basic material properties of steel that are used in design. As early as 6,000 years ago, early civilizations used iron ore found in meteorites to construct primitive tools. The first iron furnaces appeared in about 1400 BC. These were very simple rounded hearths in which iron ore and charcoal were heated to very high temperatures. By reheating, ironworkers could hammer the metal to remove impurities and increase hardness. It was realised that by making high-quality iron very hot and adding a few other metallic elements an even stronger material could be produced. Small amounts of crude steel were first manufactured in eastern Africa and India as early as 300 BC. The Europeans and Chinese developed steelmaking processes a few hundred years later. The industrial revolution had a major impact on steel demand for machinery, railroads, and other ambitious industrial projects and in 1855, Henry Bessemer took out a patent on his process for rendering cast iron malleable by the introduction of air into the fluid metal to remove carbon. The story of the Bessemer steelmaking process is a classic example of the military impetus for technological development. During the Crimean War, Bessemer invented a new type of artillery shell. The generals reported that the cast-iron cannons of the time were not strong enough to deal with the forces of the more powerful shell so Bessemer developed his improved iron smelting process that produced large quantities of superior quality steel. Modern steel is still made using technology based on Bessemer's process. Iron is manufactured in a blast furnace. First, iron ore is mixed with coke and heated to form an iron-rich clinker called ‘sinter’. Sintering is an important part of the overall process as it reduces waste and provides an efficient raw material for iron making. Coke is produced from carefully selected grades of coal. 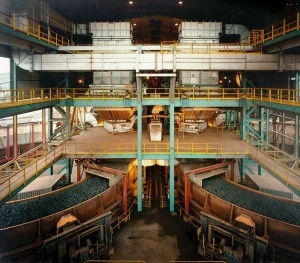 Different grades of coal are stocked separately and blended before transfer to coke ovens. The coal is heated, or ‘carbonised’ in the ovens until it becomes coke. It is then removed from the oven, cooled and graded before use in the blast furnace. The coal gas produced during carbonisation is collected and used as a fuel in the manufacturing process while by-products such as tar, benzole and sulfur are extracted for further refining. Coke, ore and sinter are fed, or ‘charged’, into the top of the blast furnace, together with limestone. A hot air blast, from which the furnace gets its name, is injected through nozzles, called ‘tuyeres’, in the base of the furnace. The blast air may be oxygen-enriched and coal or oil is sometimes also injected to provide additional heat and reduce coke requirements. The blast fans the heat in the furnace to white-hot intensity, and the iron in the ore and sinter is melted out to form a pool of molten metal in the bottom, or hearth, of the furnace. The limestone combines with impurities and molten rock from the iron ore and sinter, forming a liquid ‘slag' which, being lighter than the metal, floats on top of it. The charging system at the top of the furnace also acts as a valve mechanism to prevent the escape of gas, which is taken off through large-bore pipes to a gas cleaning plant. An important feature of iron making is that the process is continuous. When a sufficient quantity of molten iron accumulates in the hearth of the blast furnace, it is tapped off into ladles for steel-making. As slag builds up on the surface of the molten metal it, too, is tapped off at regular intervals through a separate ‘notch’ or taphole. Meanwhile, the raw materials continue to be charged into the top of the furnace, and heated air blasted in at the bottom. This process goes on throughout the ‘life’ of the furnace, which can be 10 years or more, before the heat-resistant brick lining begins to deteriorate. The furnace is then relined. The basic raw material for steel manufacture is either the hot metal from the blast furnace , steel scrap or a mixture of both. The proportions of material used vary according to the process and the type of steel required. Steel can be described in general terms as iron with most of the carbon removed, to make it tougher and more ductile . There are many forms (grades) of steel, each with its own specific chemical composition and properties to meet the needs of the many different applications. Two major steelmaking processes are used today in the UK. Hot metal from the blast furnace and steel scrap are the principal materials used in Basic Oxygen Steelmaking (BOS). 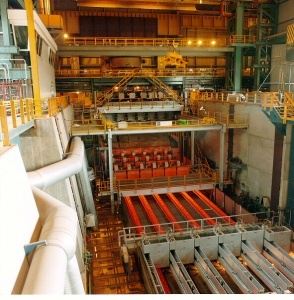 Modern furnaces, or ‘converters’ will take a charge of up to 350 tonnes and convert it into steel in around 15 minutes. A water-cooled oxygen lance is lowered into the converter and high-purity oxygen is blown on to the metal at very high pressure. The oxygen combines with carbon and other unwanted elements, eliminating them from the molten charge. These oxidation reactions produce heat, and the temperature of the metal is controlled by the quantity of added scrap. The carbon leaves the converter as a gas, carbon monoxide, which can, after cleaning, be collected for re-use as a fuel. During the ‘blow’, lime is added as a flux to help carry off the other oxidized impurities as a floating layer of slag . The quantities of scrap, hot metal and lime and other fluxes are calculated to ensure the correct steel temperature and composition. In many plants, the refining process is assisted by the injection of gases, including argon, nitrogen and carbon dioxide, through the base of the furnace. 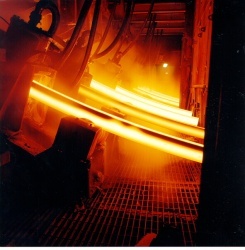 After the steel has been refined and samples taken to check temperature and composition, the converter is tilted and the steel is tapped into a ladle. Typically, the carbon content of the steel at the end of refining is about 0.04%. During tapping, alloy additions can be made to adjust the final composition of the steel. The Electric Arc Furnace (EAF) uses only cold scrap metal. The process was originally used solely for making high quality steel, such as those used for machine tools and spring steel, as it gave more precise control over the composition. Today, however, it is also employed in making more widely used steels, including alloy and stainless grades as well as some special carbon and low-alloy steels. 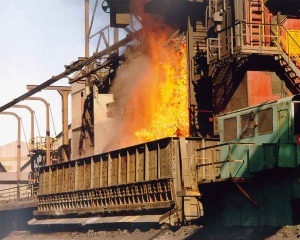 Modern electric arc furnaces can make up to 150 tonnes of steel in a single melt. The electric arc furnace consists of a circular bath with a movable roof, through which three graphite electrodes can be raised or lowered. At the start of the process, the electrodes are withdrawn and the roof swung clear. 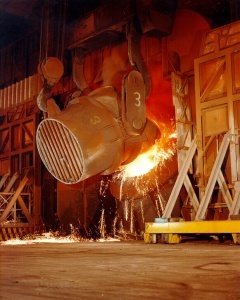 The steel scrap is then charged into the furnace from a large steel basket lowered from an overhead travelling crane. When charging is complete, the roof is swung back into position and the electrodes lowered into the furnace. A powerful electric current is passed through the charge, an arc is created, and the heat generated melts the scrap. Lime and fluorspar are added as fluxes and oxygen is blown into the melt. As a result, impurities in the metal combine to form a liquid slag. 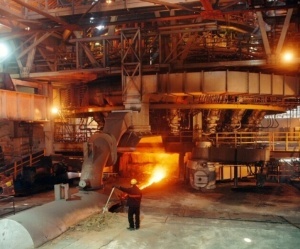 Samples of the steel are taken and analysed to their check composition and, when the correct composition and temperature have been achieved, the furnace is tapped rapidly into a ladle. Final adjustments to precise customer specification can be made by adding alloys during tapping or, subsequently, in a secondary steel making unit. (Because EAF steel is made with 100% scrap, there is a temptation to specify this in preference to BOS steel in a well meaning effort to reduce environmental impact. This is discouraged by the metals industries and the reasons are explained in the Resources section). 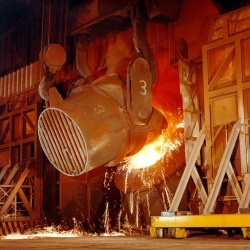 After the molten metal is tapped into a ladle from the BOS furnace or EAF it is often given one or more extra treatment(s) depending upon the grade of steel required. These further refining stages are collectively known as secondary steelmaking and can include ladle stirring with argon, powder or wire injection, vacuum degassing and ladle arc heating. Some high-grade steels combine all of these treatments. These processes improve homogenisation of temperature and composition, allow careful trimming to precise compositions, remove harmful and unwanted gases such as hydrogen and reduce elements such as sulphur to very low levels. The main by-products produced during iron and crude steel production are slags (90%), dusts and sludges. The worldwide average recovery rate for slag varies from over 80% for steelmaking slag to nearly 100% for ironmaking slag. There are three main types of marketed ironmaking or BF slags, categorised by how they are cooled – air-cooled, granulated, and pelletised (or expanded). Air-cooled slag is hard and dense and is especially suitable for use as construction aggregate. It is also used in ready-mixed concrete, concrete products, asphaltic concrete, road bases and surfaces, fill, clinker raw material, railroad ballast, roofing, mineral wool (for use as insulation) and soil conditioner. Granulated slag forms sand-sized particles of glass and is primarily used to make cementitious material. Concretes incorporating granulated slag generally develop strength more slowly than concretes that contain only Portland cement – the most common type of cement – but can have better long-term strength, release less heat during hydration, have reduced permeability, and generally exhibit better resistance to chemical attack. Pelletised or expanded slag has a vesicular texture (like volcanic rock) and is most commonly used as a lightweight aggregate. If finely ground, it also has cementitious properties. Steelmaking slag (BOF and EAF) is cooled similarly to aircooled BF slag and is used for most of the same purposes. As the production process varies at this stage depending on the type of steel being made, the resulting slags also have diverse chemical properties making them more difficult to use than ironmaking slags. Some of the recovered slag is used internally in the steelmaking furnace or sinter plant, while approximately 50% of the recovered slag is used externally in construction applications, primarily roads. Gases from iron-and steelmaking, once cleaned, are almost fully reused internally. Coke oven gas contains about 55% hydrogen and may prove an important hydrogen source in the future. It is fully reused within the steelmaking plant, and can provide up to 40% of the plant’s power. Dust and sludge are collected in the abatement equipment (filters) attached to the iron-and steelmaking processes. Sludge is produced from dust or fines in various steelmaking and rolling processes and has a high moisture content. The dust and sludge removed from the gases consist primarily of iron and can mostly be used again in steelmaking. Iron oxides that cannot be recycled internally can be sold to other industries for various applications, from Portland cement to electric motor cores. Before molten steel can be rolled or formed into finished products, it has to solidify and be formed into standard, semi-finished casting products which are available in basic shapes called billets, blooms or slabs. Until the development of the continuous casting process, these shapes were always produced by ‘teeming’ (pouring) the molten steel into ingot moulds. The ingots are placed in soaking pits (ingot re-heating furnaces) to bring them up to a uniform temperature before being passed to the primary mills, which then begin to roll them into the required shapes. However, most modern steels are now continuously cast. In the continuous casting process the molten metal is poured directly into a casting machine to produce billets, blooms or slabs. Continuous casting eliminates the need for primary and intermediate rolling mills, soaking pits and the storage and use of large numbers of ingot moulds. It also increases the yield of usable product from a given weight of steel and processes the steel into a semi-finished form nearer to that of the finished product. 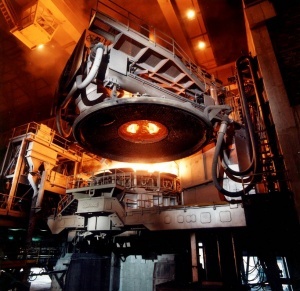 In the process, a ladle of steel is brought to the continuous casting plant by overhead crane and after pre-treatment, which may involve stirring by the injection of an inert gas (argon), the open mouth of the ladle is covered by an insulating lid to reduce heat loss. The whole unit is lifted by crane onto a rotating turret. This makes sequence casting possible – the casting of a number of ladles of the same grade steel without stopping the machine. This is also an important factor in reducing costs. Before the casting operation, a gas-tight refractory tube is fitted to the outside of the ladle nozzle. This device prevents the liquid steel from taking up excessive oxygen and nitrogen from the atmosphere. The ladle nozzle is then opened, allowing the steel to flow out of the ladle into the tundish, a reservoir supplying the water-cooled copper mould of the casting machine, through another gas-tight tube at a controlled rate. 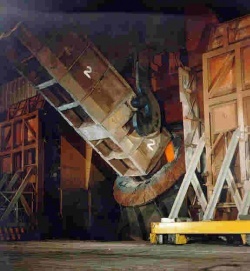 With only its outer shell solidified, the steel is then drawn downwards from the bottom of the mould through a curved arrangement of support rolls and water sprays until it emerges horizontally as a solid steel slab from the discharge end of the machine, where it is automatically cut to the lengths required. ArcelorMittal is a world leading steel company guided by a philosophy to produce safe, sustainable steel. We manufacture a range of sections including columns to UC356x406x1299, beams to UB920x420x1377 and European equivalents. Steel grades are S355, S460 and Histar including weathering steel rolled sections. All are BES6001 accredited for responsible sourcing. British Steel provides a wide range of steel products to the UK construction industry. As the only UK manufacture of heavy structural open sections, we provide premium products with full traceability and a reliable service. No matter how large, small or specialised, our quality products and processes are tailored to meet all steel requirements.